Hardcover, 10.75 x 12.75 in. / 250 pgs / 150 color. 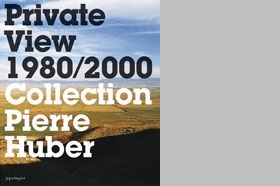 Throughout the 1980s and 90s, visionary Geneva gallerist Pierre Huber seems to have had a crystal ball for what's destined to last in contemporary art. And when he's gazed into it in amassing his private collection, he's seen photography, contemporary Chinese art, abstract painting and other art forms. 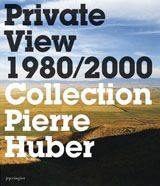 This catalogue, published on the occasion of an exhibition at the Musée cantonal des Beaux-Arts, Lausanne, gives others a glimpse of what Huber was seeing at the moment of inspiration: in America he found particular interest in appropriation art (Sherrie Levine, Cindy Sherman, Louise Lawler) and the wild California scene (Mike Kelley, Paul McCarthy, Jim Shaw); closer to home, he acquired work by some of the most innovative German photographers (Thomas Ruff, Candida Höfer, Thomas Struth) and Swiss artists (Sylvie Fleury, Ugo Rondinone, Olaf Breuning). Abstract painting and contemporary Chinese art also make appearances in this impressive overview. FORMAT: Hardcover, 10.75 x 12.75 in. / 250 pgs / 150 color.